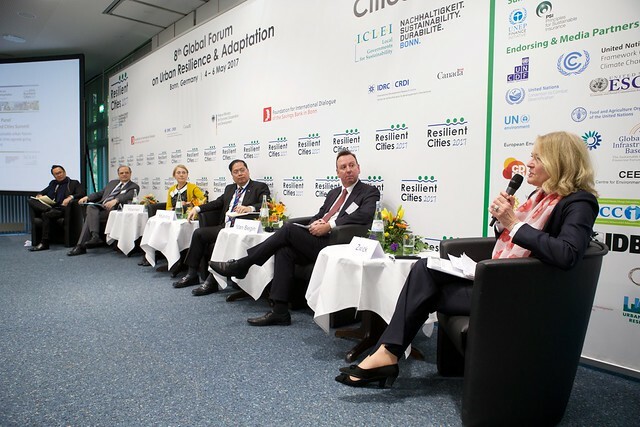 June 2017, Bonn, Germany – Cities are a lynch pin in National Adaptation Plans, sustainable development, vertical integration and contributions to Nationally Determined Contributions (NDCs). In the recent session on “Urban Resilience: Critical Ingredient of National Adaptation Planning Process” at the 8th Global Forum on Urban Resilience and Adaptation - Resilient City Series, representatives from the Joint UNDP-UN Environment National Adaptation Plan Global Support Programme (NAP-GSP), connected with municipal leaders, city planners, academics, research institutions and a broad range of essential stakeholders to explore the connection between cities, climate change adaptation planning, nationally determined contributions, vertical integration and more. The key goals of the session were to showcase major gaps in identifying climate threats in cities, outline key success ingredients to build urban climate resilience, convene a realistic step-by-step approach to building urban climate resilience, explore entry points for enhancing municipal finance for resilience programming, and assess and discuss synergies with international development partners in implementing the approach. The Urban Resilience session was facilitated by UNDP Programme Specialist Julie Teng, from the joint UNDP-FAO Integrating Agriculture in National Adaptation Plans Programme (NAP-Ag), funded through the German Federal Ministry for the Environment, Nature Conservation, Building and Nuclear Safety. Manuel Araujo, Mayor of the City of Quelimane in Mozambique, outlined the city’s experience with adaptation planning. In order to deal with these challenges in a city where more than 55 percent of people live below the poverty line, Araujo is engaging with civil society, educators, law enforcement and other decision makers to build a strategy that aligns with national priorities, and meets the specific needs of planning in a high-density urban area. Some of the measures in the works include vulnerability mapping, mangrove restoration, resilient housing design, composting of urban solid waste, and smarter sanitation facilities. Marcin Szpak, representing the City of Gdansk, presented the city’s successful experience in climate change adaptation planning, innovative financing and effective implementation. The former mayor of Gdansk also highlighted the Regional Urban Climate Resilience Initiative (RUCRI) under development with UNDP. The RUCRI programme is designed to complement ongoing initiatives towards strengthening urban resilience. It is based on the premise that urban resilience creates an opportunity to address long-standing poverty and equity issues, including gender inequality and other forms of social injustice. Specifically, the RUCRI programme will focus on strengthening urban resilience to climate related shocks and stresses while recognizing that other stresses (economic, political, social, etc.) are also part of the equation. Stelios Grafakos, IHS Erasmus University, provided an overview of accessing private-sector financing by municipalities based on the Second Urban Climate Change Research Network Assessment Report on Economics and Private Finance. Finally, UNDP’s Expert Kaczmarski highlighted the importance of evidence-based, bottom-up approach in national adaptation planning and the need for integration of cities’ climate change adaptation planning and financing with National Adaptation Plan frameworks. This can be well informed by specific cases from the NAP-GSP experience. In all, the NAP-GSP programme provides support to over 30 countries worldwide. According to Kaczmarski, cities need to become a part of NDC allocations. They are the key actors in linking investment financing needs with domestic sources of market financing and can gain access to supplementary financing from domestic banks and capital markets. The follow-up discussions, questions-and-answers period, and interesting synergies between other UN agencies such as UN Habitat, presented a number of conclusions and next steps that can frame the way cities improve their effectiveness in application of climate resilience measures. Cities need assistance to access scientific information on long-term climate change scenarios and their local implications. Cities also require access to information on financing opportunities. Cities and local authorities are best positioned to effectively and expeditiously address the climate change adaptation. Evidence shows that the most effective adaptation takes place in urban settings. National adaptation policies need to be driven by evidence, thus the vertical integration in climate change adaptation planning is a must so that NAPs can be informed by best practices on the ground. Cities need assistance in adopting sustainable systems for climate change adaptation work that would be integrated with national policies, procedures and funding allocations. NAPs are one of the most suitable entry point frameworks that could facilitate that process. In order to effectively introduce vertical integration into NAP systems there is a need to provide support via readiness and PPF projects, thus NAPs could become practical entry points for delivering of such assistance. Standardization of practices and procedures helps coordinate activities and facilitates cities’ access to supplemental sources of funding.